If you have ever been corrected in Finland when you called a Finn "Scandinavian" or were corrected in Iceland for use of the term, you may be surprised. Also, is Denmark a Nordic country and are the Danes actually Scandinavians? Knowing the difference between the terms Scandinavian and Nordic is a distinction often hard to make for anyone that is not a resident of the countries in the region. Find out what the difference is in the usage of these expressions. Although in the rest of the world the words "Scandinavian" and "Nordic" are used in a similar manner and are interchangeable, in northern Europe, they are not. Indeed, Europeans love to magnify even the smallest difference between neighboring countries and you will probably be corrected if you don't use the words in their appropriate context. The true problem is discovered when Europeans (or even Scandinavians) themselves cannot agree on the meaning of "Scandinavian" and "Nordic." In order to understand, it's important to go back to the basics to clarify each expression. Geographically speaking, the Scandinavian peninsula is the area shared by Norway, Sweden, and part of northern Finland. From this perspective, the Scandinavian countries would, therefore, focus only on Norway and Sweden. Linguistically, Swedish, Norwegian, and Danish have a common word called "Skandinavien." That word refers to the ancient territories of the Norsemen: Norway, Sweden, and Denmark. This definition is considered to be the most commonly accepted definition of "Scandinavia" at the present time, but this interpretation can easily change as you travel across different regions. So we focus on the territory of the Norsemen when referring to Scandinavia. However, Iceland was also one of the Norsemen's regions. In addition, Icelandic belongs to the same linguistic family as Swedish, Norwegian and Danish. And, so do the Faroe Islands. Therefore, you will find that many non-Scandinavian natives connect Scandinavia to Sweden, Norway, Denmark, Finland, and Iceland. And finally, Swedish is used partially in Finland just as Finnish is spoken in Norway and Sweden. Again, this gives a new, wider, definition which includes Norway, Sweden, Denmark, Iceland, and Finland. Culturally and historically, the north of Europe has been the political playground of the kingdoms of Norway, Sweden, and Denmark. Finland was once a part of the kingdom of Sweden, and Iceland belonged to Norway and Denmark. 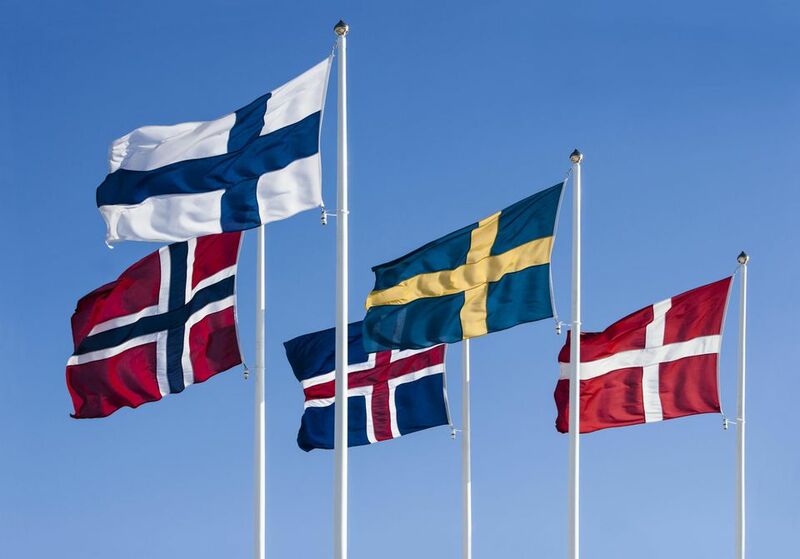 Besides sharing a common history, politically, these five countries have followed a similar economic model known as the Nordic welfare state since the 20th century. Adding to this state of linguistic and geographical confusion, the French invented the term Pays Nordiques or "Nordic Countries," which has become a common term to bring together Scandinavia, Iceland, and Finland under the same umbrella. The Baltic countries are the three young Baltic republics of Estonia, Latvia, and Lithuania. Neither the Baltic countries nor Greenland is considered Scandinavian or Nordic. However, there is a close relationship between the Nordic countries and the Baltics and Greenland. The Baltic republics have been strongly influenced, both culturally and historically, by the Scandinavian countries. The same applies to Greenland, a territory which is closer to America than to Europe but belongs politically to the kingdom of Denmark. Half of Greenland's historical and cultural heritage is Scandinavian and therefore these strong ties often join Greenland with the Nordic countries.